Finally, a solution to stressful and boring airport delays: a golf course at the terminal. Next time your business or vacation trip takes you through Hong Kong International Airport, stop by SkyCity Nine Eagles Golf Course, conveniently located outside one of the terminals. The nine-hole course has all the amenities of your country club back home, including floodlights at night and even a hole in the middle of a lake. Travelling light? You can rent everything you need to play a good game, like shoes, clubs, and caddies. The Nine Eagles Course is a architectural feat. Not only designed to challenge, built it was also built to be eco-friendly and beautiful. The course achieves USGA standard with its gently rolling hills and abundant bunkering. It is made up of seven Par 3 holes and two Par 4 holes fit for beginners, experts, and everybody in between. The clubhouse brings together what you would expect at your club at home, including a pro-shop and changing room, with a taste of Asia. Enjoy traditional Thai fare by eating outside to savor both the tastes and views of the East. Sold on this one of a kind travel experience? It’s affordable too. Playing Nine Holes (just enough time on a medium layover) will cost you US$50 on weekdays and US$70 on weekends. Does a dimpled car goes twice as fast? On a recent episode of the TV show MythBusters, special effects experts Adam Savage and Jamie Hyneman ran tests to see if a dirty car is more fuel efficient than a clean one. It turned out that dirt doesn’t make a difference to the mileage (in fact it reduced mileage by ~1.5 mpg). But the intrepid experimenters didn’t stop there. 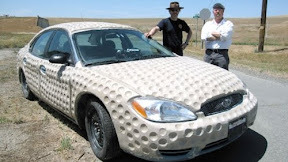 They went a step further to test if covering a car in actual golf ball-like dimples would improve its fuel efficiency? As seen in the video below, dimpled golf balls could fly almost twice as far as smooth balls, since they disrupt the air around them, which creates a smaller wake and reduces drag. So could the same principle could really be applied to race cars? To answer the question, the Mythbusters team went about adding 1,082 dimples to a Ford Taurus’s exterior. To keep the experiment consistent, all 1,082 dimples removed from the clay exterior were put in a box and then set in the back seat so that the car would weigh exactly the same as before dimpling. At constant 65 mph speed, the cleaner car gave 26 MPG and the dimpled one gave an amazing 29 MPG. The theory or the improvement is that, like a golf ball, the dimples would reduce the car’s drag through the air, thus allowing it to travel the same distance at the same speed using less fuel. So, in a difficult economy with high fuel prices, a dimpled car design can very well save you some cash. In fact, an improvement of 3 MPG translates into ~$400-600 per year of savings for the average person who drives 15,000 miles. If you have the interest to find out more, you can view the full video of MythBusters Mileage Test.